Ardency is a fascinating and expansive book, which would be difficult for me to adequately discuss in a single blog entry. So, over the next few weeks, I’ll extend my commentary in bits and pieces by discussing individual sections and poems from the book. 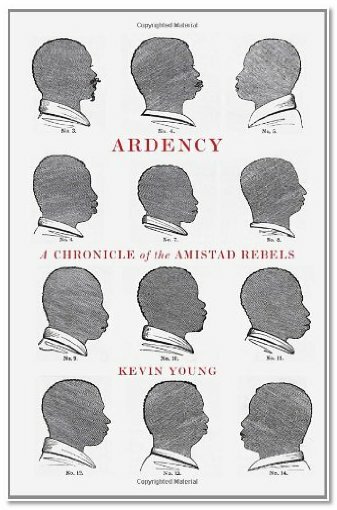 For now, it’s worth noting that Kevin Young seems very interested in showing how a book of poetry can also be a history book. In fact, the case can be made that Young is a cultural historian who produces volumes of poetry. Yeah, we can think of him as a poet and cultural historian. Well, and then, if we say that, we might as well view him as a song writer of sorts, since the longest section of the book is a libretto chanted by Cinqué. Then, the design of the book has you viewing him as a curator. And then...ok, ok, you get my point here. Anyway, there's more to say about this book.